This Packet Tracer activity “OSPF in a single area” is a great lab for those studying for their CCNA. It demonstrates how to configure and use OSPF in a network environment. 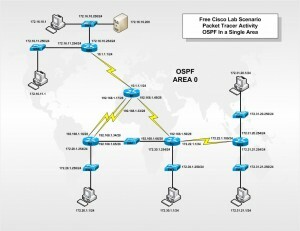 This lab is also a great review scenario for CCNP and CCIE studies. I have not locked the activity wizard so feel free to add to the lab, by trying things like access list to limit the access to server functions like http access. Also create some break-fix scenarios. Use the lab to learn more than just how to configure OSPF. OSPF is perhaps the most widely-used interior gateway protocol (IGP) in large enterprise networks. OSPF is an interior gateway protocol that routes Internet Protocol (IP) packets solely within a single routing domain (autonomous system). It gathers link state information from available routers and constructs a topology map of the network. The topology determines the routing table presented to the Internet Layer which makes routing decisions based solely on the destination IP address found in IP packets. OSPF was designed to support variable-length subnet masking (VLSM) or Classless Inter-Domain Routing (CIDR) addressing models. OSPF detects changes in the topology, such as link failures, very quickly and converges on a new loop-free routing structure within seconds. It computes the shortest path tree for each route using a method based on Dijkstra’s algorithm, a shortest path first algorithm. The link-state information is maintained on each router as a link-state database (LSDB) which is a tree-image of the entire network topology. Identical copies of the LSDB are periodically updated through flooding on all OSPF routers. The OSPF routing policies to construct a route table are governed by link cost factors (external metrics) associated with each routing interface. Cost factors may be the distance of a router (round-trip time), network throughput of a link, or link availability and reliability, expressed as simple unit less numbers. This provides a dynamic process of traffic load balancing between routes of equal cost. An OSPF network may be structured, or subdivided, into routing areas to simplify administration and optimize traffic and resource utilization. Areas are identified by 32-bit numbers, expressed either simply in decimal, or often in octet-based dot-decimal notation, familiar from IPv4 address notation. By convention, area 0 (zero) or 0.0.0.0 represents the core or backbone region of an OSPF network. The identifications of other areas may be chosen at will; often, administrators select the IP address of a main router in an area as the area’s identification. Each additional area must have a direct or virtual connection to the backbone OSPF area. Such connections are maintained by an interconnecting router, known as area border router (ABR). An ABR maintains separate link state databases for each area it serves and maintains summarized routes for all areas in the network. OSPF does not use a TCP/IP transport protocol (UDP, TCP), but is encapsulated directly in IP datagram’s with protocol number 89. OSPF uses multicast addressing for route flooding on a broadcast network link. For non-broadcast networks special provisions for configuration facilitate neighbor discovery. OSPF multicast IP packets never traverse IP routers; they never travel more than one hop.